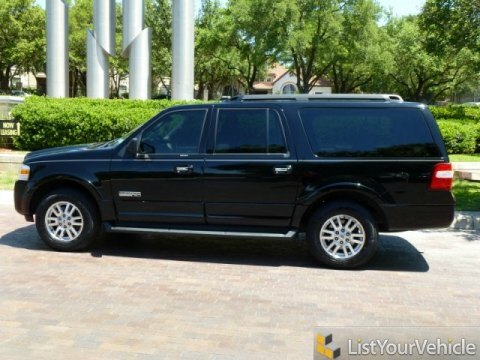 Beautiful2008 Ford Expedition EL Extended Length XLT Everything on this vehicle works perfectly! $37,770 – Original MSRP $34,870 – Original Dealer Invoice $23,507 – Current Value (Kelley Blue Book) Black Clearcoat Paint with Stone Grey Cloth interior - super-clean inside andout Well-maintained - adult-female driven, non-smoker, no pets Always garaged - including private office parking garage during weekdays Second owner (owned since 2009) - mostly easy highway miles since 2009 Third-Row Seat with extra space in cargo area (EL = Extended Length) Power Moon Roof – including Sliding Shade for Moonroof Includes FREE Garmin GPS unit for Navigation - (permanent mount/hard wired) Factory AM/FM/CD stereo with MP3 support AUX LINE IN input for iPod, iPhone, MP3 player, etc. Rear-Seat controls for stereo and A/C ICE-COLD Air Conditioning Power Windows Power Door Locks (with Remote) Tilt Steering Wheel Cruise Control Floor Mats Mechanically PERFECT -- NO ACCIDENTS...NO STORIES...NO PROBLEMS! All sales are final...no refunds. But check Seller's 100% POSITIVE eBayFeedback (1,075+) and bid with confidence! All inspections must be completed PRIOR to the end of the auction. Winning theauction is NOT an invitation to come and inspect the vehicle. Inspection fees,if any, are the Buyer's sole responsibility, but must be completedPRIOR to the end of the auction. Your bid constitutes a legally binding contract to purchase this vehicle.Please DO NOT BID unless you have the necessary funds and intend to completethe purchase transaction. Immediate deposit of $500 required via PayPal. Balance due within 7 days in theform of Cashier's Check, wire transfer or other certified funds. Buyer is responsible for picking up the vehicle or costs to transport to theirlocation. This vehicle is also for sale locally, so Seller reserves the right to end thislisting at any time should the vehicle no longer be available for sale. Seller reserves the right to cancel bids for Bidders with ZERO eBay Feedback orexcessive negative Feedback. Bidders should keep in mind that this is a used vehicle, and as such thevehicle shows signs of normal usage. There may be a few minor dings, lightscratches or other slight imperfections (as noted in the photos), but it ismechanically perfect and very clean inside and out. THIS VEHICLE IS BEING SOLD AS IS, WHERE IS WITH NO WARRANTY, EXPRESSED WRITTENOR IMPLIED. THE SELLER SHALL NOT BE RESPONSIBLE FOR THE CORRECT DESCRIPTION,AUTHENTICITY, GENUINENESS, OR DEFECTS HEREIN, AND MAKES NOT WARRANTY INCONNECTION THEREWITH. NO ALLOWANCE OR SET ASIDE WILL BE MADE ON ACCOUNT OF ANYINCORRECTNESS, IMPERFECTION, DEFECT OR DAMAGE. ANY DESCRIPTIONS ORREPRESENTATIONS ARE FOR IDENTIFICATION PURPOSES ONLY AND ARE NOT TO BECONSTRUED AS A WARRANTY OF ANY TYPE.